The FFC Cold Planer by Paladin can be used to make full-depth utility cuts, mill frost heaves around manholes, restore proper drainage to pavement, add texture to pavement for skid resistance and much more. 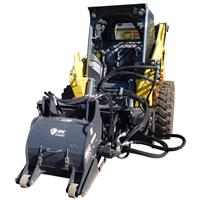 The high flow cold planers are ideal for skid steer loaders. Scarifies concrete and planes sidewalks and street joints. Side shifts 24″ left or right to cut next to obstacles. High flow models feature planetary gearbox drive for increased torque and durability. 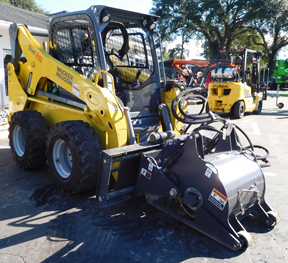 Two sizes available for standard-flow skid steers; six sizes available for high-flow skid steers. Optimized bit pattern provides a faster cut by maximizing the horsepower per bit. In-cab fingertip controls operate sideshift, tilt, and cutting depth on high-flow models. High-flow models feature planetary gearbox drive for increased torque and durability.